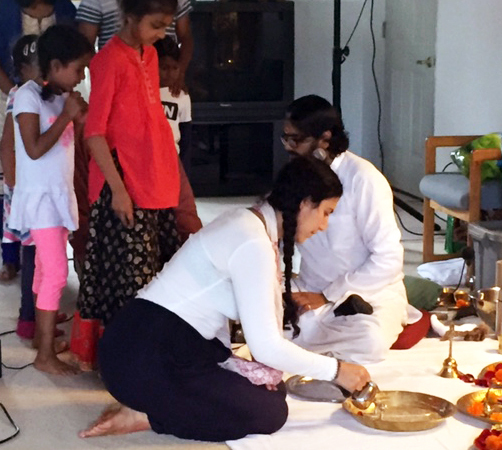 On Saturday, July 14, Amma's Toronto Satsang celebrated Guru Purnima, the full moon celebration of the Guru or spiritual teacher, with Br. Ramanand. Though Guru Purnima was officially twelve days away, Ramanandji affirmed that Guru Purnima actually occurs when we invoke the feelings of reverence and gratitude towards the Guru in our own hearts. 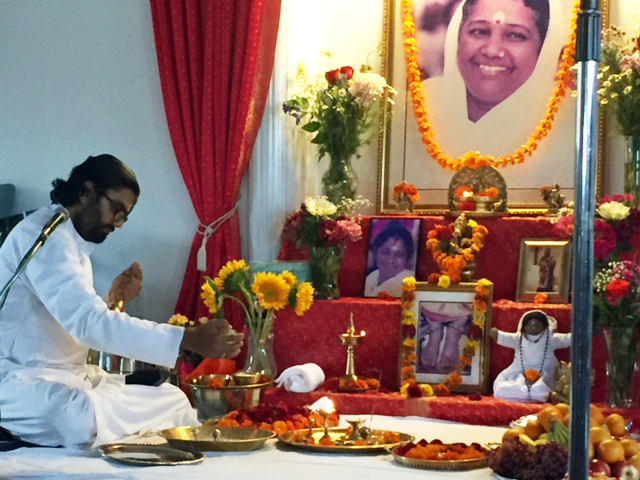 Since Amma had departed from Toronto only two days earlier, love and longing for this Sadguru Mata (Mother and Teacher) were indeed very strong in the hearts of the Toronto devotees. 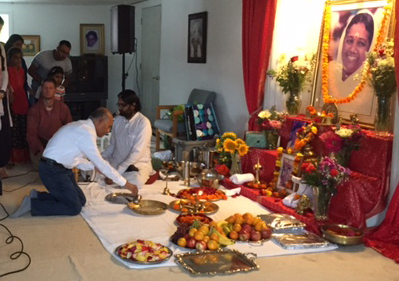 Ramanandji began the celebration with the opening prayers, and a guided MA-OM meditation. He then sang Sri Pada Mahatmyam, honouring Amma's Lotus Feet, and Harsut Akhila, invoking the blessings of Lord Ganesh. Br. 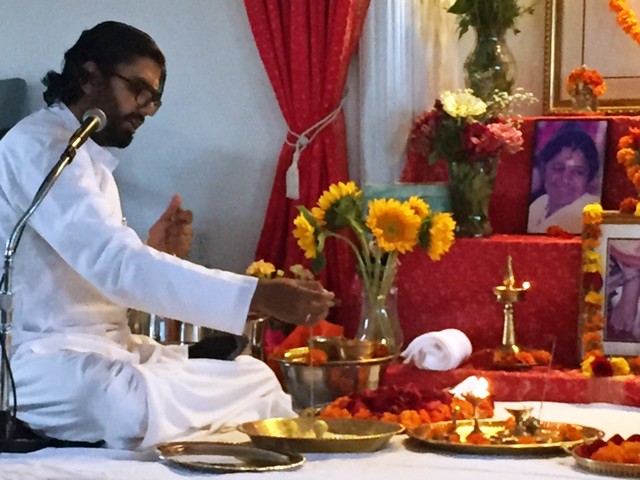 Ramanand then performed the Guru Pada Puja, symbolically bathing the Guru's padukas (sandals) with water, milk, yogurt, ghee, honey, and rose water. Ramanandji explained that when we worship the Guru's feet, we remember and revere the Divine qualities that the Guru stands for, such as unconditional Love, Truth, Purity, Compassion, and Wisdom. He fully described the symbolic significance of each offering before beginning the puja (read more here). As Ramanand made the offerings, he lead the group in chanting the Guru Stotram and the Guru Paduka Stotram, ancient hymns in honour the Guru. The satsang attendees each took turns bathing the padukas with holy water, while everyone sang Guru Kripa Drishti and Om Namah Shivaya. Once the abhishekam (ceremonial bathing) was complete, Ramanandji dried the padukas, placed them on a clean plate, and anointed them with chandan (sandalwood paste), and kumkum (vermillion powder). Br. 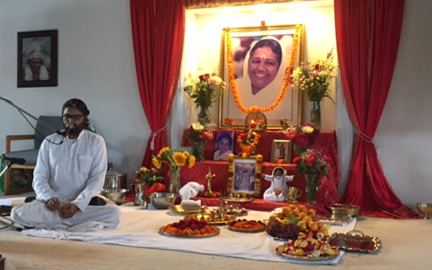 Ramanand then performed the Archana, chanting the 108 names of Amma while offering beautiful flowers to Amma's padukas. He asked everyone to visualize that, with each flower, they are offering everything to Amma: all their likes and dislikes, good qualities and negative tendencies, desires and fears. The Guru Pada Puja concluded with Arati performed with camphor. Camphor burns brightly, leaving no trace of ash. This symbolizes the complete burning of our Ego in the Light of Love. After the puja, Ramanandji gave a discourse on the significance of Guru Purnima. He explained that the word Guru can be broken down into Gu, meaning darkness or ignorance, and Ru, meaning dispeller. The Guru is thus the dispeller of ignorance. When we chant ’Tamaso ma Jyotir gamaya’, we are asking the Guru: "Take me from the Darkness (of ignorance) into the Light (of clear understanding)". Amma says Guru Purnima is the most important day for a spiritual aspirant, because on that day the aspirant reflects: "Why do I have a Guru in my life? Am I doing what my Guru expects of me?" We often are very critical of our Guru or other Gurus, but we do not ask whether or not we are a good disciple. Ramanandji told the story of a man who was critical of each and every Guru he encountered. One day, this man declared he had finally found his Guru. His friend was astounded, and asked: "Why did you finally accept this Guru?" The man answered: "This Guru said I am a perfect disciple." In a similar way, we are often attracted to teachers who flatter our ego. A True Guru, however, will not flatter us, but rather take each and every opportunity to destroy our ego. Ramanandji shared how the monastic disciples often try to impress Amma with their knowledge or skillful action. Amma never praises Her disciples under these conditions, but rather always points out some flaw or other in the disciple, thus giving them a chance to improve further. Life with a Sadguru (True Guru) is often neither easy nor pleasant. The Sadguru will nonetheless find subtle ways to keep the disciple motivated to keep going, even in the midst of difficult tests. Amma likens being with a Satguru to lying on the operating table and undergoing open-heart surgery. The only way to get through it is to surrender to the process. The surgeon knows that opening the patient’s chest, and cutting and stitching their heart will cause the patient a lot of pain. Still, the surgeon does not hesitate because they know this is the only way to save the patient’s life. Likewise, the Sadguru knows that the process of removing the disciple’s ego is extremely painful for the disciple. Layers upon layers of false identification with body, name, fame, position, possessions, and relations must be removed. Even so, the Satguru does not hesitate from doing this even for a moment. Though this may seem cruel, the Satguru is truly the embodiment of compassion, mercifully providing powerful anaesthesia to help the disciple endure this experience: the Sadguru’s amazing love holds the disciple and consoles them, as they go through the painful process of transformation. Amma was once asked: “Who is your Guru?” Amma is a Jivanmukta: She was born with full awareness of her True Self. Despite this, Amma replied: “Everyone and everything around me is my Guru, because I have learned, and I continue to learn from everything around me.” Amma learned from a blade of grass how to be humble: when a big hurricane comes, the big trees are uprooted, but the grass just bends with the wind and stays firm. Amma learned kindness and generosity from the animals who came and fed her during her sadhana period. Amma learned so many lessons from her biological mother, Damayanti Amma. Likewise, Amma learns something from everyone. We may think: "If I can learn from everyone, why do I need a Satguru?" We require a Satguru because we often cannot discern on our own what we should assimilate and what we should reject. Water is found in the ocean, in the well, and in the gutter. When we are thirsty, however, we should drink from the well. If we drink from the ocean or the gutter, we will become sick. At the moment, we are like small, innocent children without understanding. We are bombarded with conflicting messages from the world, and don’t know how to find peace and happiness. The Satguru is like a Mother who teaches Her children what is good for them and what is harmful. She takes their hand and leads them on the right path. If we allow ourselves to be led by such a Satguru, every day becomes Guru Purnima for us. After the discourse, Br. Ramanand led the group in singing Teach me the Language of Love. Before singing the last bhajan, Jinki Karuna He Apar, Ramanandji invited everyone to forget all their worries and problems, close their eyes, and dissolve in joy while singing to the Divine Mother. The devotees then took turns performing Arati to Amma, their eyes alight with love for their Satguru. Ramanandji lead the group in a guided meditation for World Peace. With minds stilled and focussed by the beautiful satsang, everyone visualized white flowers of peace falling like snow upon all of creation, bringing solace, harmony and peace to all the sentient and non-sentient beings. The satsang ended with closing prayers for illumination and peace for all. May all of Amma's children become living examples of Her Teachings, bringing love and peace to all they touch!